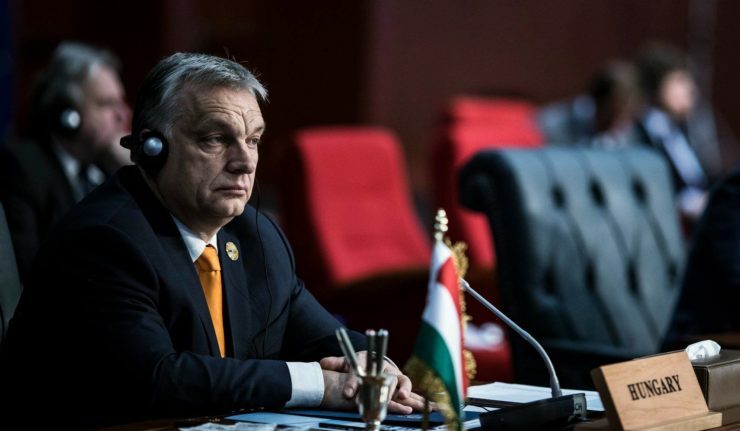 Hungary – The saga of the conflict between the European People’s Party (EPP) and one of its members, Hungary’s ruling Fidesz party, is not yet over. The Hungarian government’s latest propaganda campaign, which linked the current President of the European Commission, Jean-Claude Juncker of the EPP, to George Soros provoked a severe reaction from the EPP’s members, who demanded the exclusion of their cumbersome Hungarian partner. A few days later, Prime Minister Viktor Orbán mentioned for the first time the possibility of a future for Fidesz outside the EPP. Many expected a clear decision at the meeting on Wednesday, March 20, especially as that same morning, Gergely Gulyás, who has been the Minister of the Prime Minister’s Office since 2018, declared that in the event that it was suspended from the EPP, Fidesz would leave the party. Manfred Weber, the EPP’s candidate to succeed Juncker, went to Budapest a few days ago to try to head off Fidesz’s exclusion, issuing his demands to Viktor Orbán. Weber seemed to advocate a suspension of Fidesz in order to avoid an exclusion that would have been damaging, from an accounting point of view, to his accession to the presidency of the European Commission. during this period, which is expected to last three months, until the Council of Wise Men prepares a report, Fidesz is unilaterally freezing its rights within the EPP. This decision, in comparison to the Austrian People’s Party temporary suspension in 2000 (when Schüssel had formed a coalition government with the Austrian Freedom Party, led by Jörg Haider), was adopted almost unanimously – 190 votes in favor, including Fidesz’s, with only 3 votes against. This decision allowed the EPP to temporarily put aside its internal disagreements between those who support Fidesz’s expulsion, those who support a compromise, and those who support Viktor Orbán (namely, the Slovene conservatives, whose country is still under pressure from the Balkan migration route; they have been Orbán’s loudest defenders). Thus, the EPP’s unity seems to have been preserved until the European elections in May. But the discussions will surely become heated in June, when blocs will have to be formed and the European Union’s positions will have to be negotiated, as for example the presidency and the composition of the European Commission, as well as the presidencies and composition of the various European parliamentary committees. Regardless of the outcome, however, the EPP’s liberal wing has not yet gotten rid of the Hungarian pebble in its shoe. This situation leaves Fidesz in a position that is both precarious and strong. Depending on the results of the European elections – in which all polls show that the EPP will come out weaker – it might very well leave Viktor Orbán to be in the position of a kingmaker within the party. If you’ll allow me I will speak Hungarian, so please use your translator machinery. If you have questions in English, I am ready to answer in English of course, but because of the Hungarian publicity and the press, please allow me to speak Hungarian. We’ve had a very interesting, stimulating and enlightening debate. In the context of European politics I’m an old warhorse, and I didn’t think that something I hadn’t seen before would happen to us, or around us. But the beauty of politics in general – including European politics – is that it’s always possible for things to happen that have never happened before. You know that in recent weeks the future of the European People’s Party has become a matter for debate. This debate, which I’m now reporting to you, has centred on the future of the European People’s Party. The European People’s Party is an unprecedentedly courageous enterprise. We’re talking about a family of parties ranging from very liberal parties of the Left to our own kind of Christian, conservative parties of the Right. The special feature of this experiment is the attempt to keep these very divergent parties within a single community; and historically – from Helmut Kohl to Wilfried Martens – it has succeeded in making the European People’s Party the greatest force in European party politics. I don’t think that the focus of interest here is Fidesz. The reason there are so many of you here is not that you’re interested in the affairs of the governing party of a country of ten million people: there are so many of you here because you’re interested in the future of Europe – in which the European People’s Party plays a decisive role. And now in recent weeks we’ve seen that thirteen parties – the left-liberal wing of this great and colourful community – have proposed the expulsion from the People’s Party of its right wing, those who are right over on the Christian-conservative wing, which is where we are. Thus they would transform the European People’s Party into an organisation with a much narrower profile, and a centre of gravity not where it is now, but much further to the left, in the liberal direction. So the debate was about the nature of the European People’s Party’s future. This is also how we approached this question. A special dimension was lent to this debate by the fact that all this has been occurring on the eve of an election campaign; and I have to say that no political formation can receive a more welcome gift than its opponent setting about slicing itself up, two months before an election. While the stakes have been the nature of the European People’s Party’s future and what its spiritual and ideological character will be, there was also the question of whether the European People’s Party will be able to restore its unity and act as a single party in the election, in order for us to beat the Socialists, to defeat them, and for our European People’s Party to remain the strongest party family in the European Union. This is what was at stake today. Although I tried, we saw that we were unable to persuade the thirteen to withdraw their proposal for our expulsion. I tried to achieve this, and I asked the party presidents to look at it, because this is not good for the campaign, nor is it good for the European People’s Party in the long run. They weren’t willing to do this, however, so today there was a debate. If they’d withdrawn their proposals, there would have been no need for this debate today; but they insisted on our expulsion, and so we discussed this for three hours. The end result is that in the future we want the European People’s Party to remain the strongest party in European politics. We would like to be able to run a united campaign. And in the long run we do not want the party – the European People’s Party – to be dominated by left-liberal ideas, but to remain a balanced party family. This will only be possible if we are also present within it, as a party which represents Christian-conservative values. In the interest of unity, this is why we’ve chosen the solution of revisiting the scenario that we tried in 2000. We proposed this as a compromise. The 2000 scenario was the “Austrian” scenario. At that time there were moves to exclude the Austrian People’s Party from everywhere, because it had formed a coalition government with Jörg Haider. Therefore Austrian People’s Party president Schüssel and his party were invited to be the subject of a mild auto-da-fé in Brussels, which resulted in the solution of the Austrian scenario. The European People’s Party asked “three wise men” to table a report for it, and on this basis it was possible to decide on the long-term future of the People’s Party, and the future of the relationship between the People’s Party and the ÖVP [Austrian People’s Party]. We thought long and hard about whether we should propose this Austrian solution. Finally we resolved that what was good for the Austrians will also be good for the Hungarians, and something which was not beneath the dignity of President Schüssel will not be beneath my dignity either. Indeed, as Mr. Schüssel will be a member of this committee of three wise people, I can say that twenty years ago Mr Schüssel was under scrutiny with regard to the rule of law, and now he will be one of those scrutinising the rule of law; and this means that in twenty years’ time I will also be investigating matters related to the rule of law – among the Swedes and other Scandinavian liberals, for example. This is an appealing prospect for me, and so we thought this was an acceptable solution. After this – if this committee of three wise people is convened – we had to answer the difficult question of what will happen while they’re preparing their report. And here again we revisited the Austrian scenario: the Austrians insisted that they could not be expelled and could not be suspended; and this is also what we insist on. The will of Hungarian citizens has ensured that in the last three European Parliament elections we received 47, 56 and 52 per cent of the vote respectively. Obviously such a party will not allow itself to be suspended or expelled, but will rather stand up and leave of its own accord. The solution we’ve chosen is that while these three people are preparing their report, we shall unilaterally freeze the exercise of our rights. We shall unilaterally freeze the exercise of our rights, wait for the report from these three people, and then sit down again to discuss matters with the People’s Party. Since then we have also decided to set up our own committee of three wise people from Fidesz. This will be led by Fidesz Vice-President Katalin Novák, who will be joined by our foreign affairs delegate Judit Varga – who deals with European affairs – and József Szájer. These are our three representatives, who will be engaged in discussions with the three people delegated by the People’s Party. After the European Parliament elections we expect them to table their report to Fidesz on how we should shape the relationship between the People’s Party and Fidesz, if there is a place for Fidesz in the European People’s Party or in what kind of People’s Party it can have a place, and what we must represent here within the European People’s Party. So for now I can tell you the good news that today the European People’s Party has made a good decision, because it has preserved its unity. It has made a good decision in terms of enabling us to launch a united campaign. It has made a good decision because we can continue to support Mr. Weber as our Spitzenkandidat – or “lead candidate” as perhaps we’d call it in Hungarian. And we’ve made a good decision because we haven’t closed any doors, and after the elections the People’s Party and Fidesz can freely decide about our relationship with each other. Of course today there was no discussion of questions of content and policy, as everyone was focused on the interplay of political forces. For my part, when I contributed I made it clear that we do not want to change our standpoint: the essence of our European political standpoint continues to be that we want a strong Europe. I think you ought to know that, in the entire European Union, the highest levels of support for EU membership are in Hungary and Poland. We have built this support in Hungary over the past nine or ten years. So we continue to be committed to a strong European Union, we are not willing to change our political standpoint, we cannot imagine any change in our position on the migration issue, and likewise we cannot imagine any compromise on the defence of European Christianity – on the defence of Christian values ​​and culture. In the future we shall continue to represent this line of policy, and when negotiations on this begin we shall make this clear to the three wise people. The only question now is: “What next?” Here it’s worth applying the wise saying of “first things first”. So, if you’ll permit, now I don’t want to deal with speculation about what will happen if our three wise people and their three wise people cannot agree, and who, how and in what way we will continue our future outside the People’s Party if we have to. This is understandable speculation, but now is not the time for it, and we’ll put it to one side for now. Our starting point must be that we’re going to campaign for the European People’s Party, we’ll be campaigning for the victory of the People’s Party, and we’ll focus all our efforts exclusively on the campaign; so that when we meet the European People’s Party and you again here in Brussels, the European People’s Party will continue to be the strongest party alliance in the European Union, since it will have the most members and the largest parliamentary group. This is what we shall be working towards over the next few months, and every other question will follow that. It’ll be enjoyable work, and not for the faint-hearted! Fidesz is not a “ruling ” party , its an elected party . Rest of the article is a treasonous libtard rambling , befitting to a bunch of soros rats begging for bonuses to their master…. Toth ur, biztosan tud angolul?